Family Style Cabin Camping – Rustic Accommodations – Private Beachfront – Church Groups – Family Events – School Retreats – Reunions – Located right on Beautiful Cape Cod Bay in Brewster! We’re happy to answer of your questions about our group rentals - just drop us a line below or call 508-896-3451. Looking for a location to hold your retreat? What about a spot for your annual teambuilding conference or a private business function? Or, how about a great location for a family reunion or church retreat? Whether you have a group of 20 people or 720 people, we can accommodate you at the Cape Cod Sea Camps! With our family style camping, group accommodations, and our un-beatable location right on Cape Cod Bay, we offer great meal plans and accommodations designed specifically for retreats. If you like the beach, we have 60 acres of waterfront property waiting for you to come and enjoy. For hiking and fishing, we have Nickerson State Park right across the street. If you enjoy bike riding, the Cape Cod Rail Trail extends right from our back yard and 20 miles onward to Wellfleet. You can go sightseeing around Cape Cod, or just take advantage of staying on the grounds and using our various meeting areas for a group lecture, take advantage of our beautiful and brand new Art Center for your next meeting. 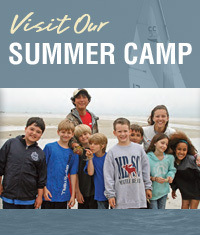 Come enjoy a Cape Cod retreat at the Cape Cod Sea Camps. We’ve been catering to various groups for over 30 years and can’t wait to meet yours!